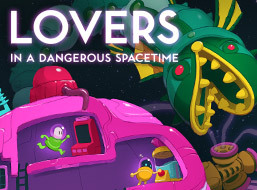 The following is a guest post by Ryan Henwood, who handled all the music and sound for Lovers in a Dangerous Spacetime. The soundtrack is available here. The Asteroid Base guys have talked about the inspirations and creation of Lovers at length, but I’d like to talk about the beginnings of the game from the audio perspective. In 2012, I decided to take part in the Toronto Global Game Jam after being encouraged by a close audio friend. Audio people were in short supply, so I was responsible for developing the music and sound effects for an entire room of teams. In the end I composed music and designed sound for 5 games within the 48 hours of the jam. Lovers was the last game that I worked on, and I only had an hour or two to create and deliver. The first renditions of the opening and gameplay music were developed at this time, along with 8 sound effects. Initially the gameplay music (now called “Launch Into Deep Space”) was just a one-minute loop. (In the final game, there are 19 pieces of music ranging from 4 to 6 minutes in length.) The genre of the music was completely out of my comfort zone–I had never composed happy spacey dance music before. Most of the time my compositions are kind of dark, so this was new to me. 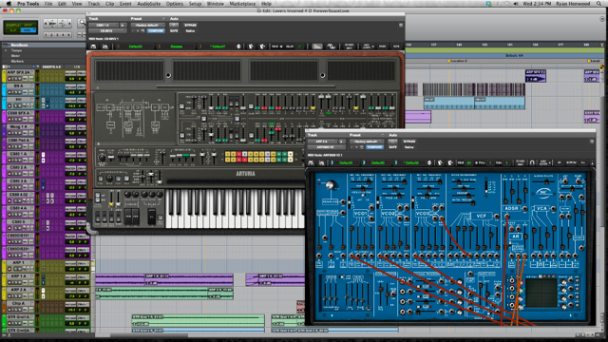 I started experimenting with different synthesizers and fell in love with Arturia‘s CS80 and Arp2600 plugins. These plugins are modeled off of the 1970s classics which have been featured in some popular science fiction films and shows such as Blade Runner and Doctor Who. I wanted the music to sound and feel vintage and not “chiptunes”, because a lot of games have been composing music in that timbre. The use of the vintage synthesizer rather than chip sounds gives it a 1970s science fiction feeling, which overall matches the design and inspiration of the game. After the jam, Asteroid Base decided that they were going to continue to develop Lovers and I was excited to continue providing the sound design and music. The first thing I wanted to do was revise the music I had written at the jam. It was rushed at the time, so now I could go back and really sink my teeth into it. A lot of time was spent adjusting the performances, changing oscillator wave shapes and just generally messing around with settings until I found the sound I wanted. Before this project, I didn’t have much experience in using synthesizers for music. I had used them mostly to create sound effects and ambiences in animation television shows. At first I was slow at being able to compose exactly what I heard in my head, but that’s the fun of experimenting and learning. Throughout the composing of Lovers there were many creative mistakes that paid off. There was one instance where I was using a chiptunes synthesizer and I was hoping to make it increasingly harsh so it would stick out of the mix more. I added a bit crusher to the process chain and instead of making the sound harsh, it actually calmed and smoothed it out. This worked better in the song than what I was expecting. So it stayed. The original song from the game jam, “Launch Into Deep Space”, was extended to about two and half minutes before I moved on to composing the additional gameplay songs. During the development process we had decided that the music length didn’t need to be kept to a minimum, and I had free reign to make the songs as long as I wanted. With “Launch Into Deep Space” being rather short, I decided to try and extend it so that it wouldn’t be so repetitive and annoying to the player. I extended the song twice, and it ended up being close to 6 minutes long. While I was lengthening it, I wrote a great melody on the ARP2600 but I felt it didn’t particularly fit into that song. Ironically, the melody line cut from the first song became the main theme and inspiration for “Forever Space Love”, which is now the game’s ending song. Follow Ryan Henwood on Twitter at @DeepRootsSound.